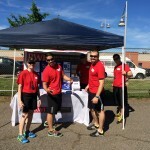 on June 22, 2014 8:46 p.m.
Not only has their exceptional athletic ability led them to successful careers in professional football and to a Super Bowl, but they are using their fame as a platform to touch the lives of others. That was all on display this weekend when all three were out there sweating on their own dime to head up camps at their respective high schools, something they don’t have to do, but want to do. Jenkins, 6-foot, 205 pounds, is a five-year pro out of Piscataway High School where he stood out in football and track, leading the Chiefs to three straight sectional titles at wide receiver/defensive back and winning the 400 meters at the Meet of Champions as a junior. An All-American defensive back at The Ohio State, Jenkins won the Jim Thorpe Award as a senior, which is awarded to the top defensive back in the country.The No. 14 pick in the 2009 NFL draft, Jenkins played five years with the Saints, winning a Super Bowl in 2010 and was eventually named the team’s defensive captain. In March, Jenkins signed a three-year contract with the Eagles as a free safety.“Malcolm is a born winner, a born leader,” said Piscataway coach Dan Higgins. “He is all about hard work and giving back. He has to be one of the hardest working players in the NFL and that’s on and off the field. What a role model he is and we’re so proud of him here at Piscataway.”Casillas, 6-foot-1, 230 pounds, is a five-year pro out of New Brunswick High School who starred in football, basketball and track. He helped lead the Zebras to a sectional title with a 12-0 record in 2003, only the school’s second unbeaten season in over 100 years of existence. He also finished third in the 100-meter dash at the Meet of Champions as a senior.After a serious knee injury at Wisconsin curtailed his college career, Casillas signed with the Saints as a free agent and wound up starting at linebacker. He was on the Super Bowl winning team with Jenkins in 2010 and was the player officially credited with recovering the onsides kick to start the second half.Casillas, who has persevered despite multiple surgeries in college and in the pro’s, played with New Orleans for three years and is now in his second year with the Tampa Bay Buccaneers. He missed the entire 2010 season after suffering a foot injury in the pre-season and suffered a season-ending knee injury after the 12th game of last season. In March, Casillias signed a one-year deal with Tampa Bay and is listed as the starting strong side linebacker on the team’s depth chart. When Jenkins first signed with the Saints, he naturally donated his time, visiting sick children, donating money for the homeless and was involved with several other causes in the New Orleans area. His mother, Gwendolyn V. Jenkins, noticed her son doing all these things, so she came up with an idea to make his presence felt on a larger scale.“He was doing all these things under the radar, going to hospitals, donating money and being so involved in the community,” explained Gwendolyn. “So I said ‘let’s put a focus on this, create a foundation and we can reach out to a larger audience. 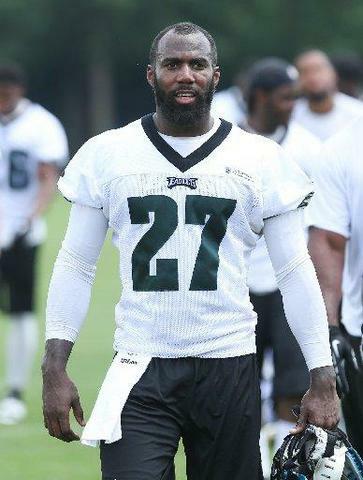 Malcolm first funded the project with $10,000 out of his own pocket.”The Malcolm Jenkins Foundation was born and is now in its fifth year with Gwendolyn serving as its president. 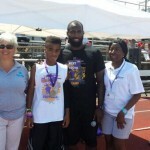 This is third year Jenkins has run a free camp at Piscataway High. 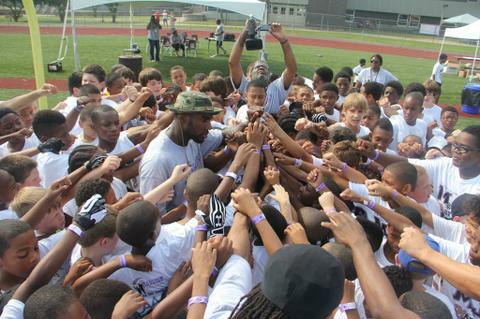 The Jenkins camp attracted 400 kids ranging from ages 7-17 on Friday and Saturday. The camp featured NFL players who flew in from all over the country using their own money and who were out there sweating while going through drills with all the campers. Each player gave a inspirational speeches about their journey to the NFL and about the importance of education and giving back to the community.This year, former Piscataway stars Dwayne Gratz (Jaguars) and Stephen Miller (Lions) were on hand, along with Larry Fitzgerald (Cardinals), Jahri Evans (Saints), Brian Robiskie (Titans), Vinny Curry (Eagles), Isa Abdul-Quddus (Lions) and Usama Young (Raiders). Added Higgins, “I get excited about this as much as anyone. The effects of having these NFL players here is far more impressionable to kids than seeing them on TV in their uniforms. It gives these kids a chance to be involved in their lives for a day, a chance to reach out and touch them in person. 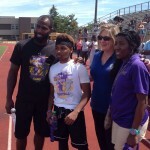 The Malcolm Jenkins Foundation is involved with so many organizations in New Orleans, New Jersey and now Philadelphia as it continues to build. This year the Foundation formed a partnership with Johnson & Johnson, SafeKids New Jersey Division, which offered sessions for the adult campers on Concussion Recognition & Recovery, Nutrition and Hydration, Acute and Overuse Injuries, Sudden Cardiac Arrest in Athletes and Anti-Bullying. Parents of all campers were invited to a session on Health/Wellness and Sports Safety Information.